Order online is easy and fast. Order your favorite Sesame Chicken, Happy Family, Szechuan Shrimp online today. We Delivery is fast. Bamboo Chinese Restaurant Guangdong Cuisine (Cantonese Cuisine)Tasting clean, light, crisp and fresh, Guangdong cuisine, familiar to Westerners, usually has fowl and other meats that produce its unique dishes. The basic cooking techniques include roasting, stir-frying, sauteing, deep-frying, braising, stewing and steaming. Steaming and stir-frying are most frequently used to preserve the ingredients' natural flavors. Guangdong chefs also pay much attention to the artistic presentation of their dishes. Located at 678 W Cuthbert Blvd, Haddon Township, NJ 08108, Bamboo-in-Haddon offers a wide array of authentic Chinese dishes, reanging from tranditional Chinese Fried Rice, Lo Mein, Chop Suey to new style entrees such as General Tso's Bean Curd, Bamboo Udon w. Chicken and Sha Cha Delight. Try our food and service today. Come in during our lunch hour (11:00 am - 3:00 pm) for a Lunch Special or during evenings for a delicious Szechuan or Hunan style dinner. You can also order your favorite Chinese dishes online or by phone. Our goal at the Bamboo Chinese Restaurant is to provide an unforgettable dining experience for all our patrons. Our lunch hours are 11:00 am - 3:00 pm daily. There are more than 10 varities of Lunch Special dishes to choose from. All Lunch Special served with Pork Fried Rice or White Rice, Free Egg Roll. Fresh shrimp,chicken,roast pork,beef w. mixed chinese veg. in brown sauce. An incredible combination of lobster meat,jumbo,shrimp crab meat and scallops mixed w. straw mushroom,baby com,Chinese vegs. And broccoli. 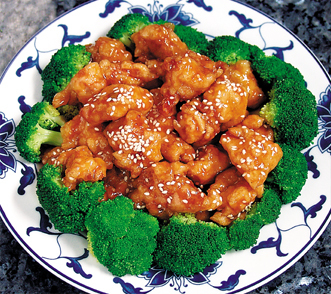 Chunks or chicken fried in a spicy sauce and surrounded w. broccoli. Shrimp mixed w. Chinese vegetable and chunks of chicken fried in spicy sauce. Shrimp,chicken,beef,roast pork,crab meat and chinese vegetable a real happy family.